Monday morning I drove my son to school as I often do. At that hour our conversation is seldom much more than pleasantries: favorite gags from last night's episode of the Simpsons, small talk about the coming day's school work and activities, maybe a peptalk about Algebra. This past Monday morning even the lightest of conversation was a little harder to carry off. 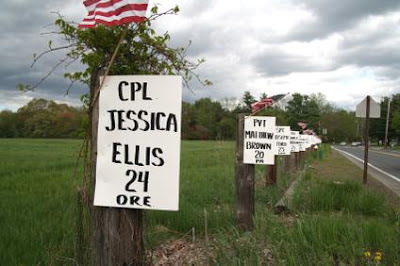 Each telephone pole between home and my son's school was marked with a sign bearing the name of a soldier. This coming weekend is Memorial Day and every year in my home town of Holliston these very simple shrines are put up along the major streets in town. The name, the state that a soldier called home, the age that soldier was on the day he died, the flag of his country stapled to the pole -these are put in place as a tribute, as a memorial, as a reminder. There isn't a particular political point of view to these displays. These memorials have gone up twice a year, Memorial Day and Veterans Day, ever since the wars in Afghanistan and Iraq began. In the first year they stretched a few miles along the main route through town. By last year they had reached from one end of town to another and reached in several other directions along sidestreets and country roads. This year not every soldier will have his or her name displayed. There are too many. You read the ages and the names from these roadside signs and you imagine the faces and the families touched by tragedy. You think of the many parents, children, brothers, sisters, cousins, loved ones and best friends. You think of the waves of loss travelling out from each name. You try to imagine the pain you would feel as you count on one hand the difference in age between a dead young soldier from Texas and your own son riding in the seat beside you. You think of your mother's own worry and prayer and your own brother's brave pride as he readies himself for an overseas deployment with The National Guard. You think of every argument you've had against these on-going wars, of your rage at the way it seems some would prefer not to question or dwell upon the bloodshed. You think of the anger that has come to rise even from pleas for peace. Your heart aches. These memorial shrines are attached to telephone poles, generally, and as such they appear every thirty or forty feet along the side of the road. There is something solemn and fitting in this -even beautiful. There is something of the slow and persistent cadence of a procession brought to mind, even as you drive along on an empty errand or take your child to one appointment or another. That cadence enters your thoughts without your even knowing it. It enters your heart. There is a slight incline along Hollis Street as you approach Holliston High School. And until you reach the crest of this slope you don't see the school. Across from the front door of the building is an open pasture, only a couple of acres of grazing land. Along one side of the pasture there is a little side road where the kids who smoke all gather before school. This field is fenced off from the road by chickenwire strung between treated posts. These posts are spaced every six feet or so. This past Monday morning every one of the posts along that pasture and across from the school was flying a flag in the wind. Every post bore a dead soldier's name and age. As we came to the crest of the hill my son and I saw all those flags together. That slow cadence of the other memorials changed to something more powerful and urgent and tragic. We had been listening to a cd on the car stereo: Neil Young's latest recording, a collection of protest music, some of it quite angry. There was a song playing just then that said something about "the flags of freedom flying." That particular song was less angry. More simply it expressed a bewildered pain. We turned into the parking lot and I dropped off my son like I've done a hundred times before. There was a part of me that was glad every kid showing up to school that day was going to see those flags, every teacher, and every parent dropping off their teenaged child. That part of me wanted to explain something to my son before he headed off to classes. It wanted to define what we saw and say what it meant. It wanted to have an answer to the question "what then are we to do?" But that part of me couldn't come up with words just then. We hardly said a thing to each other as he climbed out of the car and walked away. They say a picture is worth a thousand words and that might be right. This Monday morning I sensed what an image can say once it has entered deep inside you, what the image of all those flags and all those names can say, something much more profound than a thousand words of argument or anger, something like a simple prayer for peace. Originally published MetroWest Daily News Memorial Day, 2006 at which time 2,606 American soldiers had died in Iraq. Since that day another 1,474 soldiers have fallen. Tom driscoll is an opinion columnist, poet, performiing songwriter (let's just say he writes). "They pull me back in"